I found this tutorial most helpfull, thanks a lot. 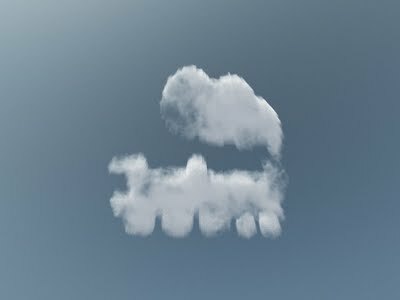 But when I tried to render high resolution images I noticed some strange "jitter" effect on the clouds. Wanted to increase accuracy but it was already at 100%. Solution is to increase size of the object giving the form, pushing the cloud level higher and increase the softness. Now I have to get rid off the grainy look. Really nice effect. It would be nice to have a step by step for us just starting out in xStream. Like the settings in the advanced editor and how to get it all lined up since it's transparent. I got lost too fast! Sorry this will only work with Vue 6. Vue 5 doesn't have the spectral cloud model that is uses or the ability to have cloud layers influenced by objects. I really like the concept of this tutorial and have been looking for something like this for some time. Unfortunately, the files do not work with Vue Infinite 5 and I am unclear on how the mesh objects interacts with the cloud layer exactly (boolean?). Any additional details or compatible files would be greatly appreciated. Thanks for this tutorial as well as the one on the sun rays.